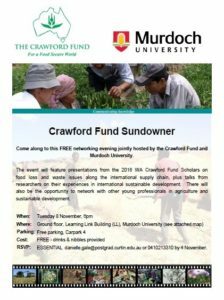 The Crawford Fund’s Western Australia State Committee and Murdoch University are jointly hosting a free networking evening on Tuesday 8 November. The event, to be held at Murdoch University, will feature presentations from two of WA’s 2016 conference scholars, Xixi Liu and Thomas Taylor, on food loss and waste issues along the international supply chain. There will also be talks from researchers on their experiences in international sustainable development. Importantly, these events provide the opportunity to network with other young professionals and researchers in international agriculture and sustainable development. Please see the event flyer for further information. You will be required to RSVP by 4 November to Danielle Gale. James Ridsdill-Smith, Program Coordinator for the Western Australia Committee, will be launching the new Crawford in Western Australia student awards for this year at this Sundowner Event. Applications for the Student Award and the International Training Award are due by early December. Keep an eye on our website as more information becomes available.